These temporary markings were used in small post offices where mostly only one postmark was available. When such a postmark needed to be repaired or engraved (according the new orthography or to a new type) in the meantime a temporary marking was to be used, either a hand written marking or some kind of rubber stamp, or a combination of hand stamp and hand writing. Such temporary markings, or provisional markings, where also used in some cases before the actual post office had got their first standard postmark. Also are items seen from small post offices, indicated by a registration mark or label where the stamps are cancelled with a postmark from the nearest large post office. Obviously the small post office hadn't got their standard postmark yet. It is unclear if the mail was stamped at the small post office (cancel borrowed from the larger post office) or the mail only was forwarded to the larger post office to be cancelled there. In some cases Riga (or other) standard postmarks were used during a short time when the ordinary postmark was sent to the workshop for reparation. Registered letter from Rodova (Radava, later Atauga), indicated by the boxed registration stamp "Radavas p.p.n. 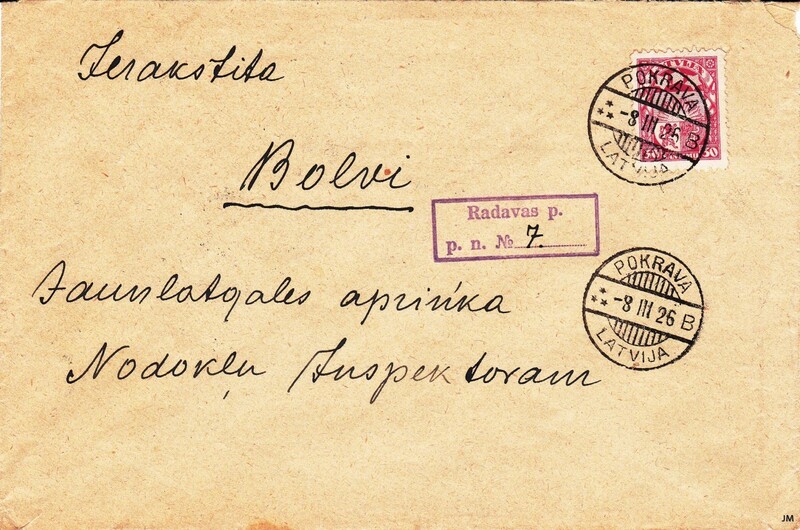 No 7", sent to Bolvi (Balvi) and cancelled POKRAVA B -8 III 26. The 1st standard postmark of Radova was delivered 12.06.1926 (earliest seen March 1928) therefore this letter was forwarded to Pokrava (later Kaceni) where it was cancelled and then forwarded to its destination. Postmarks on reverse: POKRAVA B -9 III 26, and upon arrival ar Balvi BOLWI A 12 3 26.